Every time I get my hair done, my stylist always remarks how fine my hair is. It’s sooooo thin and fine and I hate it! I would love to be able to have long thick beautiful hair. Instead I am stuck with my “see through” hair that I can’t grow too long or it starts to fall out. I am always looking for products to volumize and give my lifeless hair some oompf. There are little tricks that I have learned over the years to help my hair appear fuller and I am happy to tell you that I now have a new tool to add to my arsenal: got2b fat-tastic Instant Collagen Infusion Root-Boosting Spray! 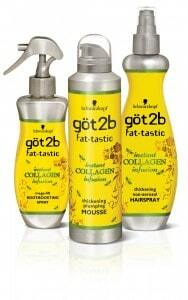 I am so glad that the folks at got2be has some new products for us girls with thin, fine hair! This spray uses collagen to lift the hair at the roots and give it lots of body. I sprayed it on my roots after my shower and then again when I am doing my hair. I like that it’s not sticky like hairspray normally is. It worked great and gave my hair the body and fullness I was looking for. I know there’s no quick fix for thin, fine hair and it’s here to stay, but I am glad to have products like this particular one by got2b, to at least appear to have more hair than I actually do!